This is the story of Peach Girl, a young girl that pops out of a “great big peach” on the doorstep of a childless couple. Peach Girl, named Momoko, wants to make the world a better place. Only the world has a big ogre in it that eats small children. But Momoko is brave and so the couple help her get ready for her journey. They make clothes out of the skin of the peach, make a helmet and shield out of the pit of the peach, and make dumplings for some food out of the peach itself. And off Peach Girl goes. Along the way to the ogre’s island she meets many animals who are willing to help because the dumplings smell so delicious. In the end the Peach Girl does make the world a better place, all thanks to a little bravery and some yummy peach dumplings. 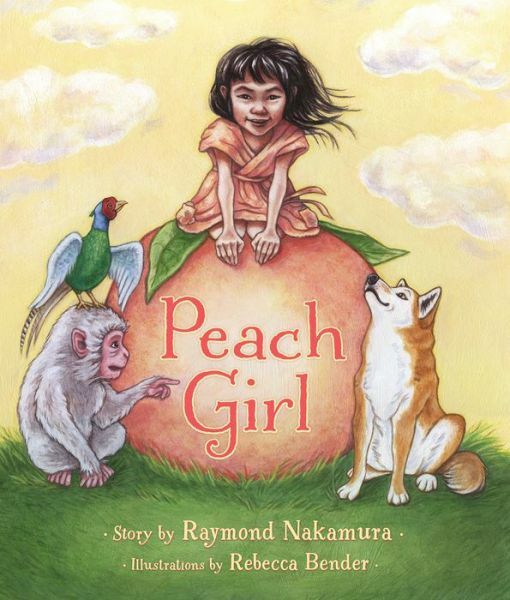 This is a fun folk tale “inspired by Japan’s Peach Boy story”. The illustrations definitely have a Japanese flair and are rich with different tones of orange and peach colors. Readers who enjoy cultural tales will enjoy seeing this particular one. Though they may wonder about the couple who helped Momoko at the beginning of the story and were never seen again. March 2, 2015 in book review, elementary school, fairy tales, juvenile, picture books.